You are here: Home / About Farming & Food / Can I Eat Raw Cookie Dough? 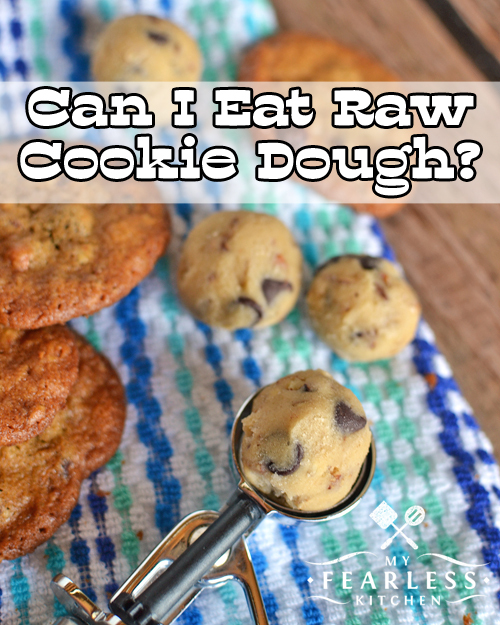 Can I Eat Raw Cookie Dough? 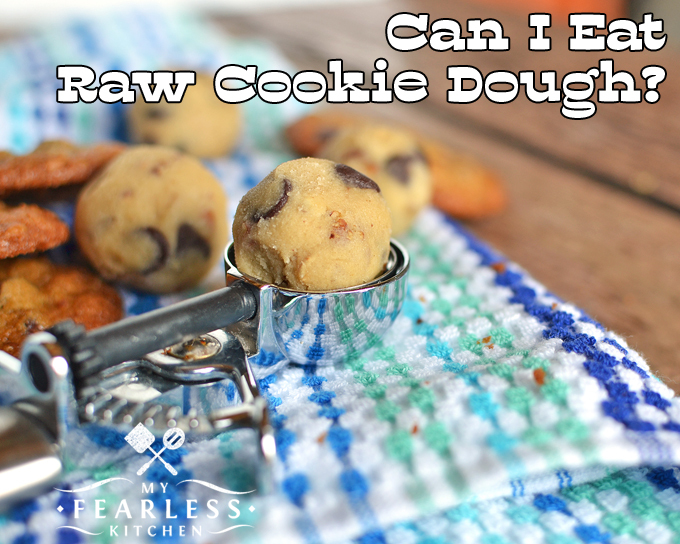 Have you ever eaten raw cookie dough? 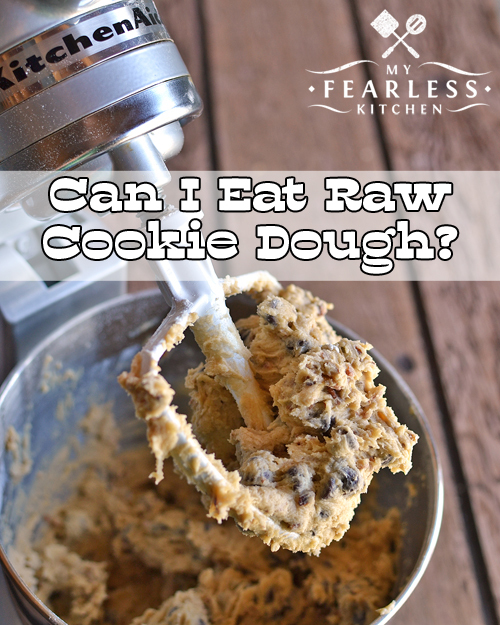 Is it safe to eat raw cookie dough? Find out why – or why not – and get some yummy cookie recipes to try. You’ve probably heard that you shouldn’t eat raw cookie dough, because of the eggs. It’s true, raw eggs can carry Salmonella. (Learn more about Salmonella food poisoning here.) That’s why you should cook eggs until the yolks are firm (160 degrees F, 71 degrees C). But in the spring of 2016 the United States Food and Drug Administration started to advise that you shouldn’t eat raw cookie dough for another reason – the flour. It is not very common, but flour can be contaminated by the bacteria E. coli. E. coli can cause very serious food poisoning. (Learn more about E. coli food poisoning here.) Flour comes from wheat, and wheat is grown in a field. Like any food that is grown outside, it could be contaminated with E. coli. Again, it is not common. But it can happen. And because of this risk, the FDA recommends that you do not eat homemade raw cookie dough. This isn’t just for cookie dough. It’s for anything that has raw flour as one of the ingredients. That includes bread dough (wash your hands after kneading), homemade cake batter, or even homemade play clay. Really, anything with flour in it, before you cook it. You can use pasteurized eggs (or pasteurized liquid egg products) to make homemade cookie dough. You can also use heat-treated flour to make homemade cookie dough. Pasteurized eggs and heat-treated flour have been treated to kill any bacteria that might be present. You can eat commercially prepared raw cookie dough. Check the packaging – it should say something like pasteurized or heat treated. You could bake lots and lots of cookies. Check out the recipes below! What’s the Difference Between Baking Soda & Baking Powder? Do You Need to Refrigerate Butter? And if you want even more desserts, be sure to check out my Dessert Board on Pinterest! You did a great job explaining the risk of eating raw cookie dough that includes unpasteurized eggs and/or flour that has not been heat treated. Sharing this article on Happylicious by Betsy’s Facebook page. Thanks! Thanks! I love that Happylicious by Betsy balls are made with heat-treated flour, so I can eat all I want and not worry about those risks at all! Where do you find heat treated flour? It can be tough to find heat-treated flour, and it’s more expensive than “regular” flour. Check in your grocery store (although they are not widely available there yet). You can also look on Amazon or other online shopping that you like. Your best bet would be to try a restaurant supply store.